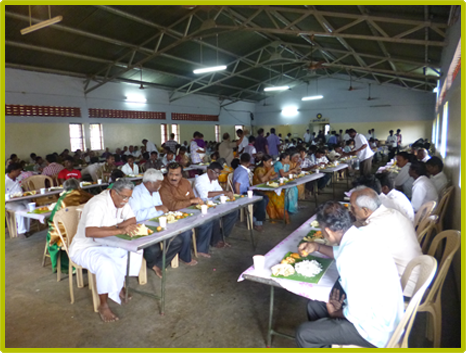 Annathanam (lunch) is provided everyday for all the devotees who visits the Arulmigu Palamalai Aranganathar Temple and . It is beleived that the stomach part of the Lord Ranganathar is in Palamalai and so that all the devotees and peoples around the Palamalai temple are served with mid-day lunch everyday. Our Honourable Chief Minister had started a Annathanam plan for all the devotees in many temples. As per the annathanam plan, everyday mid-day lunch in provided in this Palamalai Temple for all the devotees and peoples around this palamalai. If you are interested to provide annathanam in your name for a day, then you can register your name by paying Rs.1000/- (Rupees Thousand only) and Annathanam will be provided to all in your name on that particular day. As well as you can pay Rs.15,000/-(Rupees Fifteen Thousand Only), so that yearly once Annathanam is provided to all by the interest amount attained from your amount. As per the government order 80G, Tax Exception is provided for this Annathanam Plan. 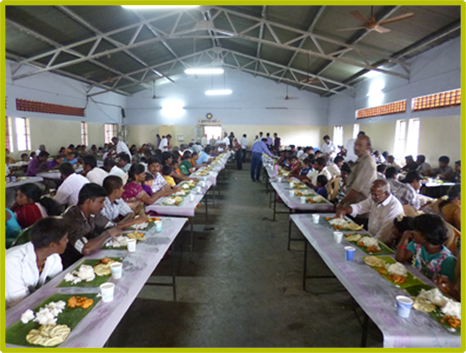 Around 200 to 300 peoples are served with Annathanam every day. On special occasions such as like Puratasi Saturday, Chitra Pournami, etc more than 1000 peoples will be visiting the temple and Annathanam is provided for everyone. Extend your great hands to contribute to the Annathanam in your name to serve people at Arulmigu Palamalai Aranganathar Temple. To participate in the Annathanam plan, Kindly contact the Heredetary Trustee. Thank you.